Left, Secretary General (AT) Wilhelm Gidabuday and the Former New York City Marathon Champion, Juma Ikangaa. Picture by Gadiola Emanuel. 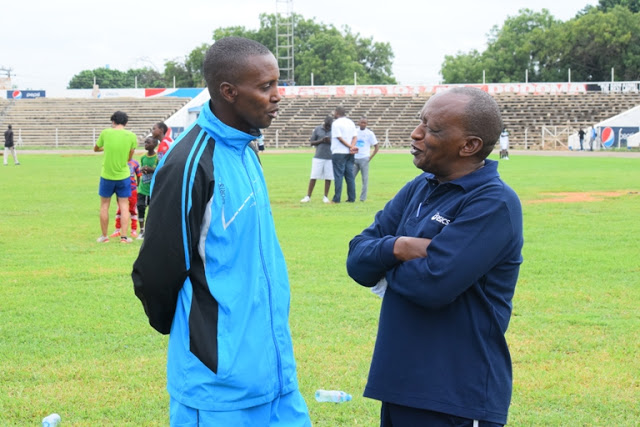 Arusha — Athletics Tanzania (AT) may be the first national sports association to shift its head offices from Dar es Salaam to the designated capital Dodoma, according to its recently elected secretary general, Wilhelm Gidabuday. He said AT president Anthony Mtaka, who doubles as the Simiyu regional commissioner, has been in touch with CDA officials over the issue. "After getting the plot, we will seek a title deed we will use as collateral to secure a loan for the project," he said, noting that they will approach the social security institutions for financial support. Gidabuday, a former national athlete and until recently, a coordinator of various athletics promotion programmes, was elected the new AT secretary general early this month. He succeeded Suleiman Nyambui who is now an athletics coach in Brunei, a South East Asia sultanate. He said he would address the major challenges facing the association, including lack of office accommodation that merits its status, working equipment and competent staff for its secretariat. "We need a modern, spacious and well equipped office which will suffice all our administrative needs," he said, noting that AT, which is one of the oldest sports associations in the country, currently does not have an office that meets its requirements. "Presently, I can dare say, we have no clear office. There is a room near the Uhuru Stadium, but it's in poor shape," he said, adding that he would fight for a comfortable office space in Dar es Salaam before the Dodoma project is realised. The long-term plan is to construct the multi-purpose building in Dodoma which will be known as Riadha Tanzania House. Besides serving as the permanent home for AT, some rooms would be rented out to other institutions. However, Gidabuday insisted that their dreams for a permanent home would depend on support from the government, especially the ministry responsible for sports, CDA, the National Sports Council (NSC) as well as the International Association of Athletics Federation (IAAF), a governing body for the athletics in the world headquartered in Monaco.